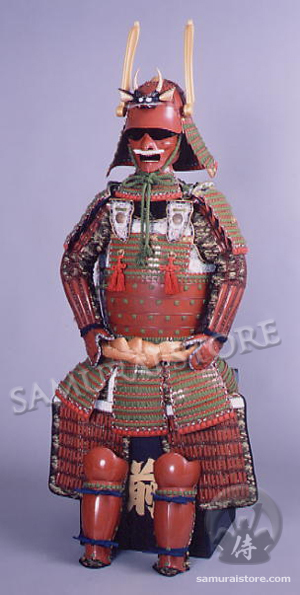 This beautiful "vermilion-red" armor with golden button colored braid lacings is created modeled on the Shogunate battlefield armor from late 1300's. The helmet has Oni side-horns and Black "Oni" amulet headbord. The body armor is hand-constructed with some iron pieces with beautiful elaborately-crafted braid lacings and chain-mails. 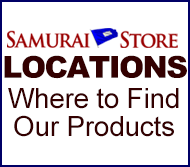 This historical armor set, suitable to display or wear, consists of the Kabuto, Yoroi and Kogusoku parts and accessories you see listed in the charts below, and can be worn. Shoulder Guards - Red lacquered iron guards.